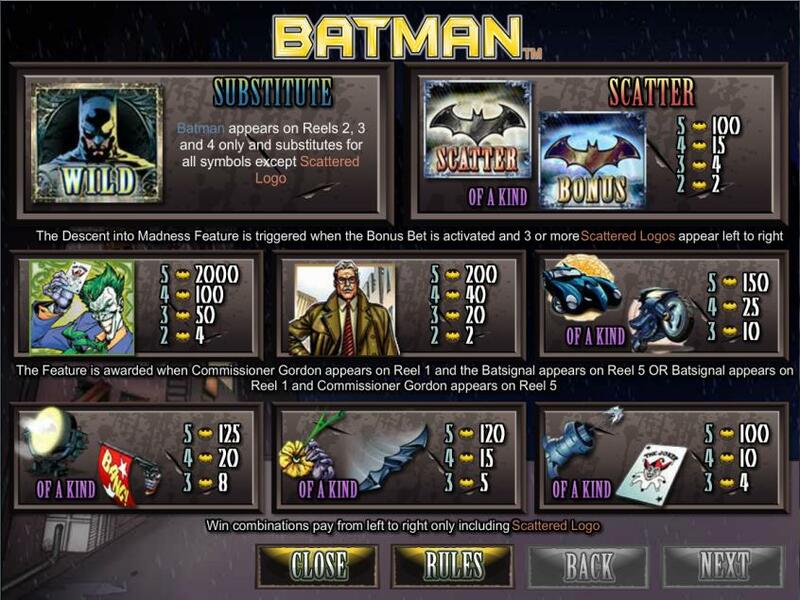 The Batman slots game offers five reels, 50 paylines and two bonus features of exciting Dark Knight action, all filled with classic characters and awesome items from the world of the Caped Crusader, including the crime fighter himself, Commissioner Gordon, the Joker, the Bat Signal, the Bat Cycle and the Batmobile. By following these simple steps you will soon be well on your way to saving Gotham City and enjoying all the thrilling fun that Batman slots have to offer. You will need to start by selecting the number of paylines and the size of the wager you wish to play with. This can be done by using the left and right arrows located either side of the panels marked LINES and BET. Clicking on the left arrow on either option will decrease the lines/bet you play with, while clicking the right arrow will increase them. The total displayed in the BET panel is the total number of credits that will be placed per line, for example, a bet of 0.10 credits across 50 lines would result in a wager of 5.00 credits being placed. Don’t worry though, the TOTAL BET panel in the lower right hand corner of the game screen will display your total wager before you play. Should you wish to perform multiple spins, an autoplay function is available. Simply select your preferred paylines and wager amount and select from between 1 and 50 spins. These spins will stop when the total displayed in the AUTOSPINS panel reaches zero, you have insufficient funds to complete a spin, or you manually override the feature by pressing STOP, the button located to the right of the feature. All that’s left to do now is click SPIN and let the reels do their thing! Once the reels have stopped spinning, the slot machine will automatically display all successful paylines and credit your account with any winnings. 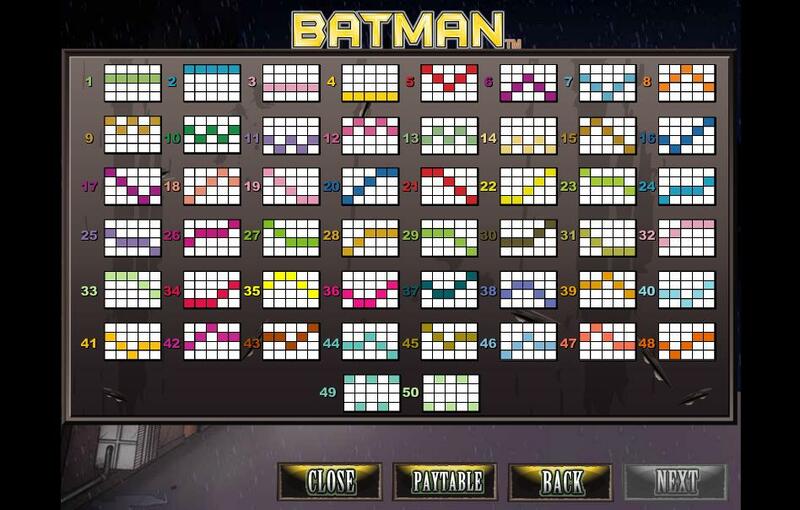 The Wild symbol is Batman himself and he can prove very useful when it comes to completing a line. When a win is detected, the Caped Crusader springs into action to signify your success. The Scatter symbol is the bat. When the Bonus Bet feature (see the Bonus Features page for more information) is selected the scatter symbol will evolve into a Bonus Bat, a symbol that can automatically activate the Descent into Madness Feature when three or more appear on any payline. In addition, all scatter prizes that appear during the Bonus Bet feature are multiplied by 50.